A versatile delicatessen; Kabobs’ Maple Peppercorn Pork Belly Skewers adds rustic warmth to any event. Consisting of hand-sliced pork belly, lightly marinated in a sweet and savory blend of maple syrup, soy sauce, aged balsamic vinegar, and crushed peppercorn; creating an impressive balance in flavor and texture. Perfect as-is, or as an accent to a Teriyaki glazed petite filet, or an accompaniment to a Taiwanese bao bun action station. 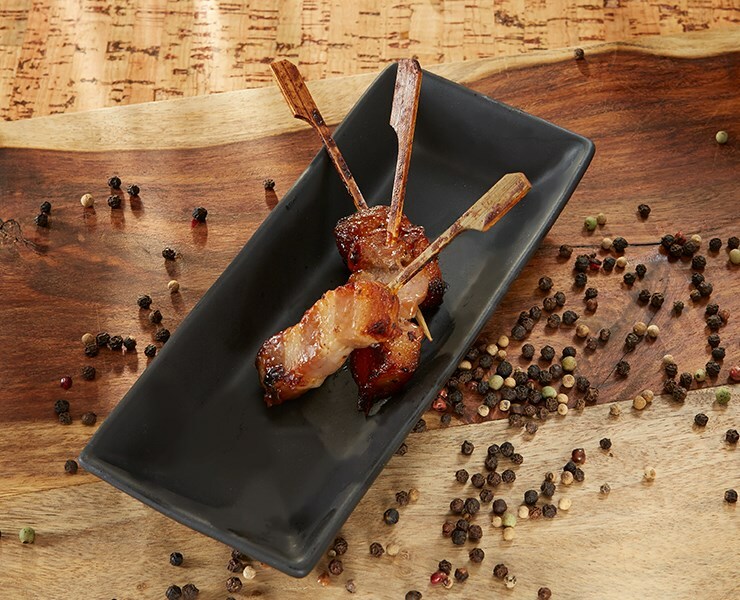 Kabobs’ Maple Peppercorn Pork Belly Skewers provide a great visual presentation, while addressing the growing consumer demand for pork belly menu adoption. From frozen bake in a Pre- Heated 300°F Convection oven for 16- 18 minutes or until internal temperature reaches 165°F as measured by use of a thermometer. •Hors d’oeuvre Serving Suggestions: Perfect as-is, or drizzle a soy or balsamic vinegar reduction. •Accompaniment Suggestion: Accents to salads, steaks, and seafood. Component to bao bun action station. •Sweet and savory flavor profile. •Increased menu placement / adoption of pork belly. A colorful pinwheel of seasoned chicken tenderloin, red, green and yellow peppers and fiery jalapeno cheese hand-threaded on a 4" skewer.